Doug was diagnosed with prostate cancer in October 2017 and since then he has used his cancer diagnosis as a source of creative fuel. 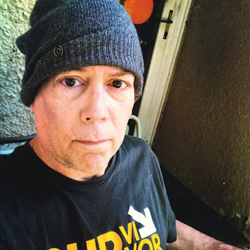 Doug has been very outspoken about his journey with cancer and writes about it in detail on his blog and instagram page. Hello, can you please introduce yourself in a few words? Hi, my name is Doug. I turned 58 earlier this year and I work as a software engineer, artist, and writer. How and when were you diagnosed with prostate cancer? Were you having any symptoms prior to diagnosis or was it during a routine check-up? What doctor/specialist established the diagnosis? I was diagnosed with stage 4 prostate cancer in October 2017. For a week or so before my diagnosis, I was experiencing difficulty urinating; a classic symptom of both prostate cancer and other non-cancerous prostate problems. I went in for a check up with my GP and had my PSA tested. That was on a Friday. My doctor called me on the following Monday and told me that my PSA was incredibly elevated at 5,306. I had no idea it could be that high. Needless to say, I was shocked and completely overwhelmed by the news. My doctor ordered a CT Scan, which I had a few days later, and I went to a local NCI-designated cancer center the following week to meet a urologist and a medical oncologist. I had a prostate biopsy at the cancer center and my Gleason score was a 9 (5+4). That’s nearly as bad is it can get. The urologist who performed my biopsy told me before the procedure that the odds of me having aggressive prostate cancer were high given my PSA numbers and he wasn’t wrong. I met with a medical oncologist a few days later to strategize my treatment options. What treatment have you been going through since the diagnosis? Has it been efficient? Current standard care for my situation is chemotherapy (or abiraterone acetate, often known by the brand name Zytiga) along with ADT (Androgen Deprivation Therapy). I had six cycles of chemo (Docetaxel), once every three weeks. My treatment went from November 2017 to February 2018. I receive a Lupron (ADT) injection every three months and that will continue indefinitely. The treatment was very effective and brought my PSA down to 22, which was an impressive drop. My PSA has since gone up a few points, but nothing clinically significant. I continue to see my oncologist every six weeks for a PSA test and a check up. I imagine I’ll have further treatment in the future, but it all depends on how long the Lupron remains effective. Typically prostate cancer will eventually figure out how to produce its own testosterone, which means a second-line of treatment will be in order. I’m very supportive of clinical trials and I’ll certainly join one if there’s one I qualify for when the time comes. What has been the biggest change in your life since the diagnosis? How has it changed, or not, your view on the world? How has it impacted on family and friends? A diagnosis of stage 4 cancer is definitely life changing. I’ve made some of the pragmatic changes many patients make for improving their health – moving to a plant-based diet, more exercise, and working on stress relief, which in my case is mainly through meditation. On a more personal level, I’ve had my own mortality shoved in my face, which has caused me to re-examine my priorities. I’ve learned to slow down and really appreciate life, all those things we too often take for granted - family, friends, and something as simple as a morning sunrise. My cancer is incurable, but as many stage 4 cancer patients discover, incurable stage 4 cancer is not the same thing as terminal cancer. It becomes more of a chronic condition. Of course it’s different for everybody, but the advances in cancer research in the last five to ten years have been amazing. I’ve chosen to make the lifestyle changes I needed to improve both my physical and mental health. As difficult as it may seem (and often is), I generally have a very positive outlook. I live with hope. Hope is everything. Has writing your blog, whenhopeisallyouhave, given you a sense of comfort? Have many people reached out to you through it? Yes, absolutely, it’s brought me a huge sense of comfort. Many people going through difficult situations find writing to be a very therapeutic experience, and I’m no exception. I’m pretty active on social media and I also write for a few different websites like The Mighty and prostatecancer.net. Between my blog (I actually have two), my art project (Cancer As Art on Instagram), and my time on social media, I’ve had the opportunity to hear from and meet many people affected by cancer. The online cancer community is amazing and we all tend to support one another as much as we can. You write beautifully on your blog, was writing always a passion or something you have embraced since your diagnosis? Thank you. I’ve always fancied myself as a bit of a writer, but more for fun. I actually wrote a computer programming book back in the early 2000s, and I’ve worked for the last five or six years as a technical book editor. I’ve wanted to write something of my own for years, but I wanted to focus on something more personal, and cancer has certainly given me that. So though I’ve written on and off for years, I’ve really focused on my writing in the last six months and don’t see myself stopping. What would you advise other patients with prostate cancer? I can’t give specific medical advice obviously, but I’ve come up with a general set of recommendations I often share with others. First, do your homework. Research, research, research! This could be reading or meeting other prostate cancer patients at support groups. Ask questions. The knowledge gained will empower you and help make you a partner with your oncologist, which in turn gives you some sense of control over your treatment. That can have a very positive affect on your outlook. Another thing to realize is that this is your life that’s at stake, so don’t be shy about getting a second, or even a third opinion. Finding the right oncologist is crucial. A good oncologist will listen to you and won’t mind you asking questions or requesting a second opinion. Another thing - don’t go through this alone. Build your support community, everyone from your medical team to friends, family, and co-workers. Whatever works for you. Rely on the help of others; don’t be afraid to ask. Many people really want to help, but they just don’t know how. Let them know what you need. And one final bit of advice. Know that you are not alone. I’ve found support groups to be a big source of support. “Finding your people” can really be beneficial. If a support group isn’t your kind of thing, that’s ok, but at least give it a try if you can. I have made some incredible new friends at my support groups, friends with whom I have the most powerful bond imaginable - going through cancer together.